Item # 314650 Stash Points: 5,495 (?) This is the number of points you get in The Zumiez Stash for purchasing this item. Stash points are redeemable for exclusive rewards only available to Zumiez Stash members. To redeem your points check out the rewards catalog on thestash.zumiez.com. Slay the streets like Kevin "Spanky" Long, with his pro model, the Baker Spanky Bad Decision 8.0" Skateboard Deck. Offering medium concave throughout for flip trick strength, this deck is additionally highlighted by equally medium wheel wells for larger, more vert or street-prone wheels. Finished with large and steep kick tails for maximized pop, this deck is ready to hit beefy gaps or quarter pipes alike. 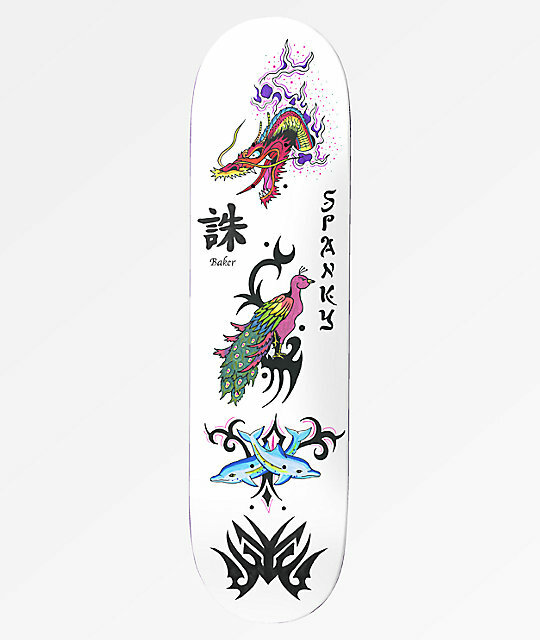 Spanky Bad Decision 8.0" Skateboard Deck from Baker Skateboards. Signature Kevin "Spanky" Long pro model.